We started the Somatic Exercises to Bust Myth of Aging series this morning. So many a-ha moments and wide eyes when folks rediscover how to move their bodies better. Even before we started with the exercises I shared some information about Hanna Somatics and how it pertains to our lifestyles and bodies. Here are some key points. First of all, it's called Somatic Education for a reason. This is not a passive-do-it-once-a-week-and-not-think-about-it way of moving your body. This is a method where ideally you need to become aware of your body, learn about how it works, and sense it to get the best results. What is Hanna Somatics, in 25 words or less? Hanna Somatics is a method of exercises developed by Thomas Hanna that correct full-body patterns of dysfunction so you can get rid of pain in your muscles and joints. Hanna Somatics goes to the root of all movement--your brain! Our brains control everything our bodies do. There are involuntary actions-- digestion, beating hearts and eyes blinking--and voluntary movements-- learning to sit up as a baby, walk, dance, knit, or drive a manual transmission. But eventually those voluntary actions become second nature and what was a voluntary action--you had to think about it and your brain was fully engaged and taking notes--becomes involuntary, so your brain can think about other things, like what's for dinner while you drive your manual transmission car home and not think about shifting gears. You with me so far? Good! How does this relate to pain and faulty movement patterns? red light reflex-- or sometimes called startle reflex, where one stands with rounded shoulders, head forward. A reflex in response to stress, fright, anxiety or depression. Like I said, these are natural responses to daily demands. But if and when we do them repeatedly or don't fully relax out of them, that they become habitual patterns. Your brain has gone offline and these reflexes have become involuntary, which then can create misalignments, tight muscles, and pain in a variety of places in the body. Just think about what most of us do day in and day out; We sit at desks with our posture either slumping or arching and our chins jutting forward. Treatments are passive. You have someone else move, massage or crack your body to "correct" misalignments. But if you want to make your adjustments last, you need to get your brain to undo the tightness, or else you're right back to where you started within a few hours or a day later. With Hanna Somatics you are proactive! You can self-regulate and self-correct so you can fix your body when you need it and learn to maintain proper posture with Hanna Somatics. 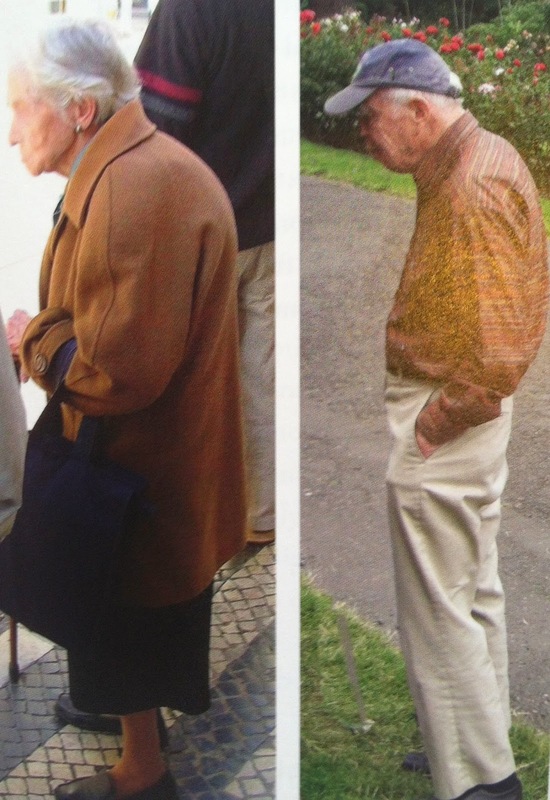 I found these photos in Kathleen Porter's Natural Posture book. 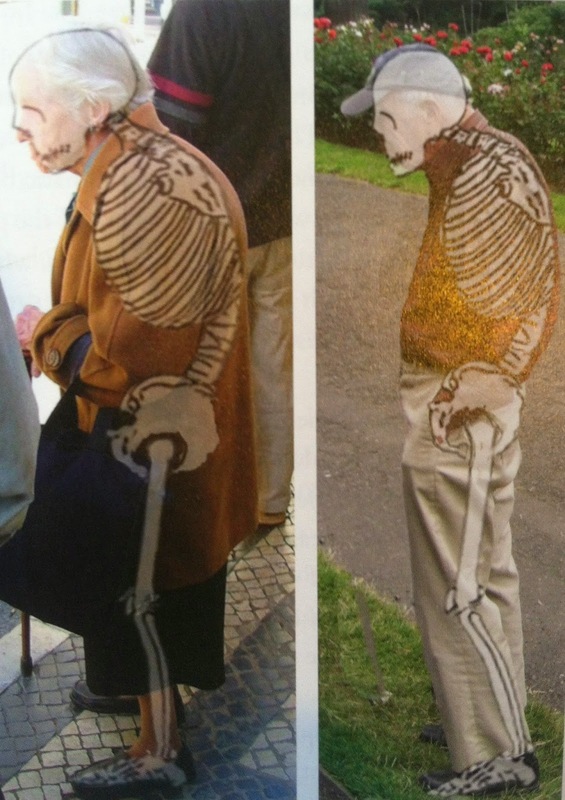 Take a look at the over-tracing of skeleton. Very enlightening! So what's the Myth of Aging? Thomas Hanna coined the term Myth of Aging. He said most things we associate with aging aren't due to getting older, but are a result of learned and habituated patterns. What if these two folks (above) hadn't spent years in the startle (red light) reflex? Sadly they probably have a whole host of aches, pains and health issues, that they attribute to aging, but could be remedied or avoided altogether with Hanna Somatics. So if your brain can learn to get stuck in these patterns, you can consciously learn to undo them. Now, that's what Hanna Somatics is all about!